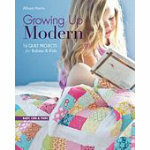 Create 16 one of a kind quilt projects to make for babies and kids, featuring today's modern quilting designs. Almost all the patterns offer sizing for baby quilts and 7 of the patterns easily adapt to fit sizes baby, crib, and twin. Includes instructions for a pillow and quillow. 128 Pages. Available: 412013.